Yeah it does have that articulated fly look/action. Seems human nature to automatically compare any “new” lure to something familiar. Happens every time a new lure is posted about. We all do it. I’ll probably get the iguana just to display on my desk along with a few others I’ve collected. I wonder if the man entering the river at or near the dam was some type of angry stunt or suicide attempt, and then the woman went in after him. I haven’t found an article yet that states a motive for him being in the river. Too cold for swimming. Didn’t say they were fishing or boating. A really odd set of circumstances for this tragedy for sure. You pretty much have to TRY to drown in the Dupe at this flow and they found perhaps the one area of maximum danger. Once again on dam removals, too little, too late! The great (broke) State of Illinois! The Fox Chain 'O Lakes draw-down is usually in November. I think it normally goes for a week or two, depending on how much water they want to release. I agree that a higher flow rate is starting to feel like the new normal on the Fox! It certainly has been an odd fall and winter. I've been following the USGS graph religiously and never saw a window of opportunity to get out and wade. The flow has remained beyond my comfort level. Looking forward to warmer days and kayaking. I've seen Mike a few times on the Fox and he has always given me a wide birth and a friendly wave. Sometimes he stops and we trade info on numbers caught and techniques used. I'm sure we fish a lot of the same water. He has always been courteous. I think the Fox is more accommodating to that type of activity. Lots more room to move around. Of course, there are the dams, so you're somewhat limited from pool to pool. I understand what the original poster is saying about the Dupe. Excellent points made. Not sure if Mike is posting on here much these days, but would be interesting in hearing his thoughts on it and if anything will be done differently this year. I'm kinda surprised anyone would want a guide on the Dupe. 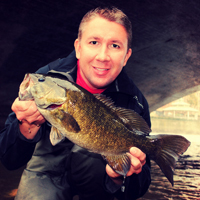 Being a small river with a plentiful population of smallies, it's a pretty easy river to fish. An inexpensive kayak and a free afternoon for a float trip will provide plenty of opportunity. I admire the risk taking and business savvy of these young YouTubers. In addition to $$$ they make off their channels, they’re teaming up with Mystery Tackle Box, etc. on licensing deals, promotions, etc. They are having a big influence on a whole new generation of anglers and adventure seekers. No doubt they are putting the time and effort in! They have to consistently publish content and work to build up a large subscriber base. Their videos are monetized, so they are getting paid from YouTube based on the #of views (#of ads shown). I imagine a lot of people are living vicariously through the YouTube anglers, especially over the winter months. I agree about the investment in quality gear and learning all the editing tools. Some of these guys have amazing artistic skills, and the tenacity to get multiple, interesting angles and add visual and audio effects to polish it off. Add in drones and cool underwater shots and it takes it to a whole new level. Jon B. seems to have set the bar for this. I really enjoyed his trip to South America with Alex Peric. I also enjoyed Alex’s trip to Lake of the Woods. There’s so much amazing content out there these days. It’s fun to follow their antics and adventurers versus the old-school “teach techniques and pimp products” that we’ve been spoon-fed since fishing shows first aired on TV. Great variety out there on YouTube! Got it a few days ago. It looks very nice. Kudos to all who contributed / created it. I’m honestly not sure. I’ll have to give them a second look. I hadn’t ever paid attention to creel limits because I don’t ever keep bass. My friend Kevin pointed out the regs while I was loading up my kayak. Now I’ve been reading the signs and noticing it more and more. 1 over 12” and 2 under 12” That’s what I see posted on many of the signs along the Fox where I fish. I get the idea of thinning out the smaller ones. Just seems odd to keep a bass under 12” for table fare. Can’t imagine there’s much of a filet off a bass that small! That was neat to watch. Wow that guy has skills!